"Goodbye Lydia!" were the last words uttered by Heisenberg in the season finale of Breaking Bad this weekend. He's the man I hold wholly responsible for the fashionably late arrival of my last hoorah as Cricinfo's Lancashire cheerleader. I can't really say it's been a rollercoaster ride, more like a comfortable journey on a Virgin train service from Division Two to Division One. Chapple's troops nearly went the whole season without losing a single game - had it not been for the dead rubber against Kent last week, when they rested a few players, they may well have achieved it. Yes, the fans would have liked to see the side achieve success in the cup competitions but the blueprint for the season had always been promotion. That they achieved, and with flying colours. Now at this stage, normally I'd start rattling through all the players and their varying degrees of success. A rant here, an exaggerated praise there, and maybe I will. But before I go there, I must salute the captain of the Emirates Old Trafford's cricketing airline, Mr Peter Moores. In previous blogs I've heaped praise on Glen Chapple for soldiering on as skipper, shouldering the burden of bowling himself into the ground for another season. I also showered Kyle Hogg with superlatives for his support of Chapple (rightly so, as he bagged 60 wickets in a career-best season for the Red Rose). I purred throughout the season at the batting displays, all of which were worthy activities. But the truth is, since the arrival of the ex-England coach Morres there has been a quiet confidence about Old Trafford I've not experienced previously. A calm assurance, that regardless of whatever happens, the side will prevail. If Robert Redford's horse whispering and Hank Moody's female whispering are things of legend then so, I propose, are Moore's abilities as a cricketer whisperer. The way young Luis Reece comfortably slotted into the fold, the way Moores' backroom staff looked after and helped Chapple, Hogg and the entire team perform so well are exceptional achievements. What's more, the recent recruitment of Jos Buttler sends a further warning to those in Division One. This team isn't looking to just make up the numbers in the top flight - it appears Moores has his sights set on bigger goals. The addition of Buttler will reinvigorate hopes of success in the T20 competition, that's for sure. His arrival seemed inevitable after a heartbroken Gareth Cross was released by Lancashire after a long association with the club. Whatever he lacked in ability during his time here, he more than made up for in passion and hard work. He'll always have memories of 2011 to cherish forever and I'm equally sure Butler will be looking to make new ones in 2014. Another player who'll be looking to the future is Simon Kerrigan. Despite his mauling of on Test debut on a flat deck against a rampant Shane Watson, I'm certain he'll make a strong comeback next year. It wasn't long ago Stuart Broad increased Yuvraj Singh's waistline in a T20 international, serving him six rather large pies in Durban in 2007. He seems to have carved out a decent Test career, so there's no reason Kegsy can't do the same. With the arrival of Kyle Jarvis this year, the question also remains whether Chapple will continue to be part of the team. The news thus far has been emphatically encouraging both from Chapple and Moores. However, the matter might not be in their control and questions will be asked of him come pre-season training. The coaching staff may have to repeat last year's exercise of another winter in cotton wool for Lancashire's senior pro. If he does carry on, I certainly might start to wonder if Isabella Rosselini has been slipping him some of that youth potion she served to Meryl Streep, Goldie Hawn and Bruce Willis in Death Becomes Her. Certainly this year, on more than one occasion, I referred to his efforts as almost herculean. 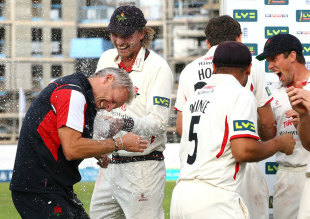 If he continues to impress next year Lancashire fans may have to start calling him Thor! Because when it comes to the Lancashire captain, it appears all good things don't come to an end, they just continue and get better and better with time.